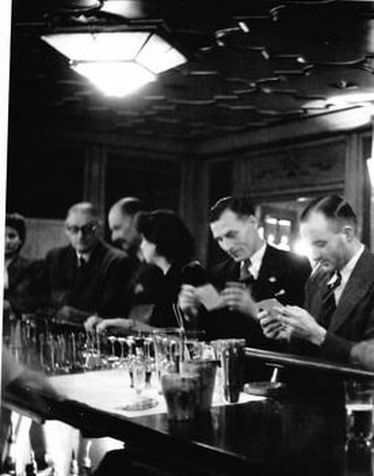 Bill's Story - THE MASSACRE AT LE PARADIS - HELL IN PARADISE - MAY, 1940. 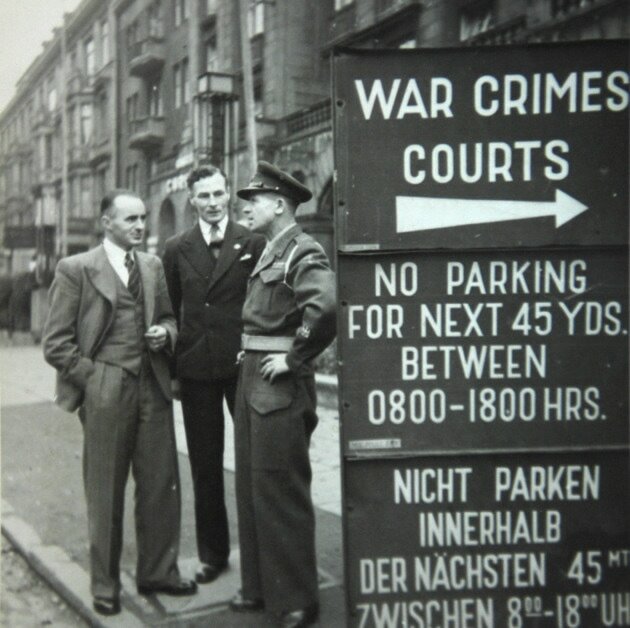 Bill O'Callaghan (left) with Bert Pooley at the war crime trial of Fritz Knoechlein. ​ AS seen in our section on the massacre, the Germans failed to execute two members of the Norfolk Regiment. Bill O'Callaghan was hit in the arm and knocked to the ground. Another body fell on him and Bill decided to play dead. He was aware of the Germans going along the line of fallen soldiers and thrusting bayonets and firing shots into them. They did this to the man who fell on Bill. But fate then took a hand as the Germans left. A number of hours afterwards Bill was woken up, after having fallen asleep, by another survivor, Bert Pooley, who had a shattered leg. Bill carried Bert to a woodpile and then a pig sty. That was some achievement bearing in mind the injuries to both men and the fact that Bert was well over 6ft tall whilst Bill stood at little more than 5ft 6in. Bill and Bert survived for three days on raw potatoes and muddy water they drank from puddles and which made them ill. Thankfully they were found by Madame Duquenne-Creton and her son Victor who owned the farm and, ignoring the danger to themselves, they sheltered the two men. 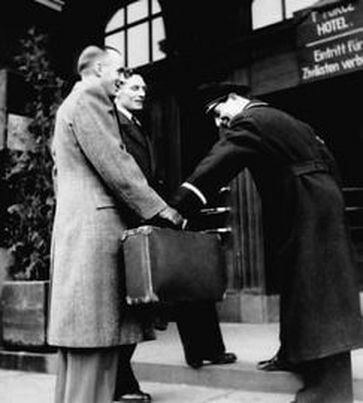 Madame Creton reported the matter to the village hierarchy and, with Bill and Bert's agreement, the two men were handed over to the German Wehrmacht 251 Infantry Division. No action was taken against the Duquenne-Cretons by the Germans. Bill spent the remainder of the war in prisoner of war camps. But let's go back to the beginning. William "Bill" O'Callaghan was born in Brentford, London, on 6th March, 1914, and moved to Norfolk at the beginning of the 1920s, although the exact date is not known, it is likely to have been 1920 or 1921 when Bill was around six years of age. Consequently Bill always looked upon himself as a "son of Norfolk", spoke with a Norfolk accent and would have had few memories of his time in London, although he always had a great interest in what was going on in the capital and had what son Dennis describes as "an in-depth knowledge of London." ​Bill's father - Hugh Ashby O'Callaghan was born in Hampshire and served in the Royal Navy in the First World War. Bill's mother was Edith Mary (nee Stephens). Bill had a sister Rhoda Pearl who was born on June 17th, 1921, and died in 1987, and a brother Charlie. Much of Bill's early years were spent living in Scarning just outside Dereham and he attended the Crown Road School in Dereham. He enlisted in the Territorial Army in 1930 at the age of 16 and then re-enlisted into the Regulars in 1932 at the age of 18. It is likely that, after leaving school and before signing up to become a regular soldier, he was employed by Hobbies at Dereham. Money was scarce in those days and at times the O'Callaghan family struggled to make ends meet and in the Forces Bill knew he would get three square meals a day. He served in Gibralter during the Spanish Civil War in 1937 and 1938 and then spent the rest of the time leading up to the Second World War training in the United Kingdom. In 1939, he went to France as part of the British Expeditionary Force (BEF). In Gibralter he served with many of the men who would be alongside him at Le Paradis. Son Dennis said that his training didn't always go smoothly: "At one point he was told he had to cycle 50 miles the next day but he had never ridden a bike. He was told he had to learn overnight. During the ride he fell off and injured himself. He had a cut head and went to a large house to get some treatment and was told by a servant that he had to go round the back." ​Bill's brother Charlie was also in the army as Dennis explained: "Charlie was also in the Royal Norfolk Regiment and was in the evacuation of Dunkirk. He later went on to serve in Italy, survived the war and returned to his home in Becclesgate, Dereham, where a memorial was later put up to Bill. Charlie and Bill were like chalk and cheese. Charlie dressed what might be termed 'normally' but my father was always very smart. He would never go out without a collar and tie." In May, 1940, Bill was one of only two survivors of the massacre at Le Paradis (see other sections for full details). 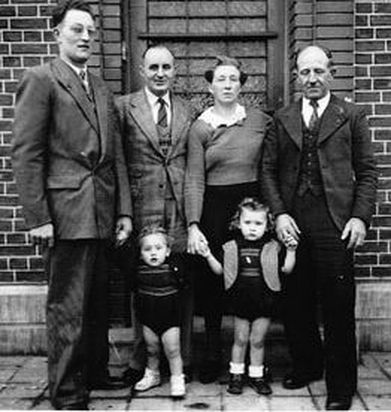 After hiding out for a number of days and being fed by local French people, including Madame Pauline Duquenne-Creton and her son Victor, Bill and Bert Pooley agreed to be handed over to the German authorities. Consequently the two soldiers were taken by ambulance to Bethune Hospital where Bert was treated for his serious leg wounds. Bill was in a much better state and after a number of days of rest and recuperation, much of the time spent with Bert and other British soldiers, Bill was ordered to prepare himself for what turned out to be a very long march. 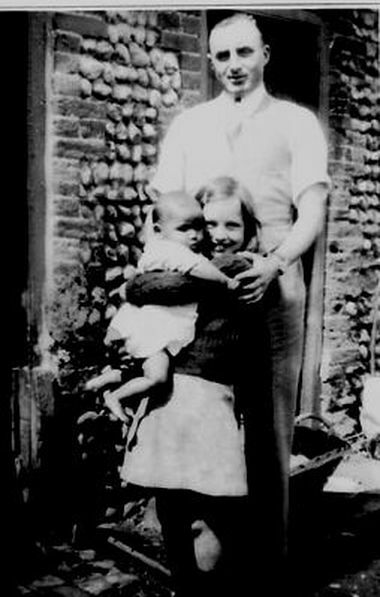 From the hospital, Bill and a number of comrades were taken to a football stadium close to Bethune and then by lorry towards the Belgium border and the town of Seclin where they stayed in a school on June 23rd, 1940. Left the hospital at 6 o'clock. Rode in lorries to a place called Sedin (Seclin in Northern France - editor), was there all day. Left again Sunday morning for Tournai in Belgium. Rained very hard at night. Indeed Bill was on the march again - this time a 25 km slog to Renaix were they were billeted in a school. The following day Bill was on the march again - this time 16 km to a place named Alost where they were forced to sleep in a field - suffering from the cold and wet. Alost or Aalst is in Belgium. Thursday June 27th saw another major march - this time 25 km to a school, although Bill's diary doesn't state where this was located. Friday June 28th saw Bill marching and being carried on a truck for a distance of 14km to the Belgium/Holland border and subsequently into the Netherlands. Still on barge. We are nearing Germany, we are getting off this evening. A pot of jam just got sent down the hold to be shared amongst 72 men. It was only a 1lb pot and it did not go round (editor's note - apparently the men drew lots with the first 10 to be drawn sharing the jam). On 1st July the barge reached Emmerich Am Rhein in Germany where Bill was amongst those marched to a local train which took them to a temporary camp at Bocholt. 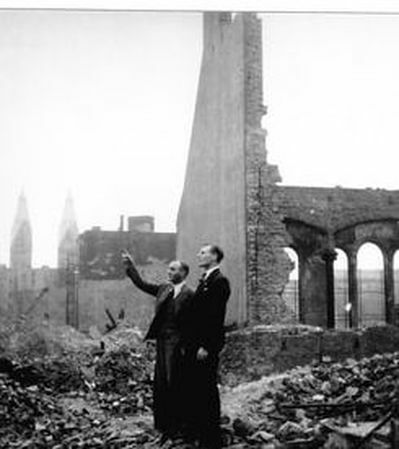 During the Second World War the city of Bocholt survived generally unscathed until an Allied bombing raid on 22nd March, 1945, destroyed most of it. It was then captured by the British a week later on 28th March. The city was the site of the Stalag VI-F POW camp. We got off barge at noon, went into a field for a short rest, then got on a train at 2 pm - 55 in a truck. It was terribly hot and rode for two hours. Arrived at a temporary camp. We are in a big tent - 800 men in camp. Bill stayed at that camp until 7th July when he was on the move again - this time in a cattle truck headed towards Poland and his next stop at Schubin. Szubin is a town in Poland. It became a town in 1434, but was first mentioned in 1365. In 1773 it was incorporated into Prussia but became part of Poland after the First World War. In September, 1939, it was occupied by German troops and incorporated into the Nazi Reich. The boys' school was used as a prisoner-of-war camp with the addition of concrete huts. The town reverted to Poland after being liberated by Soviet troops in January, 1945. Left Schubin 7.30 am, arrive Bernau 11.20. Marched about 8k to new camp, much better than last place, have mattress to lie on. Get blanket tomorrow, also two bowls of coffee and soup. Weather fine. That camp was Bernau Stalag XX1B in Warthelager near Poznan. This was an infamous prisoner of war camp. It was the place that was to be Bill's home for some considerable time. Stalag XX1D Poznan - Some of Poznań's eighteenth century forts were used as prison camps. Most notorious of these was the concentration camp, Fort VII, which was predominately used to house Polish prisoners. Some other forts, along with labour camp locations in the surrounding countryside, were used to hold PoWs. These collectively formed Stalag XXI-D and accommodated just over 3000 prisoners in total. Bill sent a postcard to his mother from Stalag XX1D Poznan. Edith was at the time living at 8, Council Houses, Scarning, near Dereham. Bill had been labelled as "missing presumed dead" so it would have come as quite a shock when that postcard got through. The message read: "Just a group of the lads from our room, taken last month. The one on the left hand end is the lad I share in with he comes from Shouldham nr King's Lynn. He is just twenty two years old. Love to you all from your loving son William." It was signed William Reginald O'Callaghan POW No 6648, Stalag XX1D II, Germany. Life in the camp at Poznan was mixed. Bill suffered badly from rheumatism in his back and, on a number of occasions, sought medical help with varied response and often no specific help for his condition. He worked in a number of roles including helping to build a cinema where the work was relatively light and the prisoners were treated well and given perks such as cigarettes and extra bread. His other jobs included keeping fires lit for German officers. Boredom was one of the big problems as the prisoners dreamed of home as Christmas 1940 approached. But they were allowed to organise sporting events such as football matches and also held concert parties with original scripts and music from mouth organs supplied by the Germans. "While a prisoner of war in Poland, a group were working on the land in the summer. They came across some new potatoes. On finding a pot, they got a fire going and were cooking the new potatoes. I believe there were four or five men involved. When they were nearly cooked, a young Nazi officer came along, saw what they were doing and kicked soil into the cooking pot until it was full. He then told them to eat the contents, threatening it would be bad for them if they didn't. So they all ate the soil laden cooked potatoes." Bill's own diaries give plenty of insights into life in the various prisoner of war camps including the following details of marches undertaken in June, 1940, just one month after the massacre. Obviously in making the entries Bill was very aware of what could happen to him if he wrote the wrong things and the diary got into the wrong hands. Bill was painfully aware of a need to remain anonymous and to help this he was always amongst the first to volunteer to move from one camp to another. This would make it difficult for him to be tracked down if it was found that he had been one of the intended victims of a massacre. Due to this, tracking down the camps that Bill found himself in is quite difficult. Below are just some of the camps associated with Bill. Stalag XX1B Wartelager Bernau - information is required on this camp. ​Stalag VIIIB Lamsdorf - Camp 344. Gleiwitz Poland January 1945 - start of the 1,000 mile march to The Castle Germany, finished on 16th May. Bill was discharged from the Forces on 18th January, 1946, and returned to Dereham to be met with quite a shock. Unbeknown to him, his mother and sister had moved to Jarrow in County Durham and his father had died. Bill found out where his mother and sister were and headed north with the initial thought of making his home there. But, after a three week stay, he couldn't settle and returned to Norfolk, staying with relatives. Bill gained employment once again with Hobbies as a metal polisher and welder. During the Second World War Dereham-based Hobbies manufactured components for aircraft. The company was better known, however, for model dolls' houses and also model guns, planes, tanks and battleships. It is likely that some of Bill's work would have brought memories of his wartime service back. 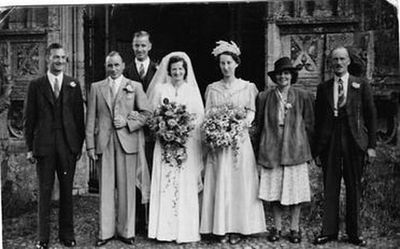 Bill's life was soon to change for the better, however, as just a few months after returning to Norfolk he met Edith Hannah Warren and they were married within a month of meeting: "I think Bill probably met her through her brother Bunny whom he knew," said Dennis O'Callaghan. Bill and Edith were married on July 14th, 1945, and Dennis was born on 27th June, 1946, and on 7th December, 1953, they completed their family when Heather was born. 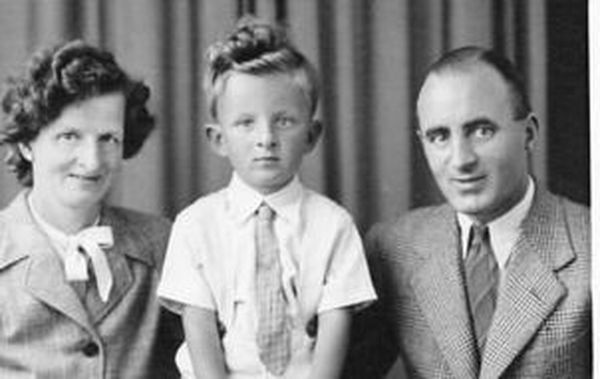 Dennis' early memories of his dad were of a dapper well turned out gentleman: "He was always very precise, very well turned out. He never raised his hand against us. He was always firm but fair and he really looked after his family. He always wanted to be in company and never wanted to be on his own. I think that came from what he had trapped inside him from Le Paradis as he never talked about it, but I know he often couldn't sleep. 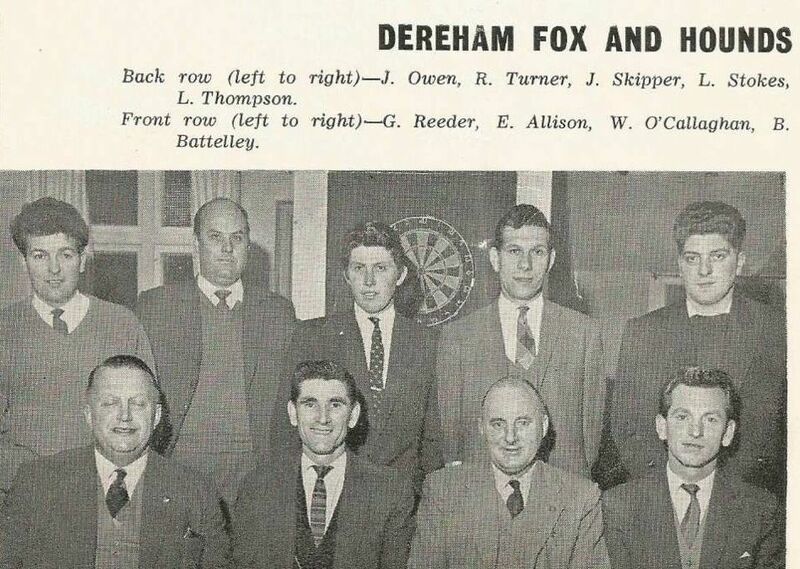 He was captain of the Fox and Hounds darts team from 1949 to 1969. "I couldn't say that he was a very practical man. My mother did all the decorating and also mended our shoes but I do remember having family games evenings. He spent more time with Heather than he did me, but essentially we were just a normal family and interested in football, cricket etc," Dennis said. Heather remembers her father's generosity and sense of fun. He would often play darts for small amounts of money such as sixpences and more often than not came home with a pocketful of coins which he gave to Heather and which were put in an East Anglian Trustees Savings Bank money box which eventually had to be taken to the bank to be opened with a key. The money acted as Heather's pocket money. "Some of the officers had red braid on their uniforms. I had to go with my father as my mother was in hospital and there was no-one to look after me. I believe it was Autumn and he was called about his war experiences and I remember it became very vocal. It seemed to go on forever and I believe it was some hours before we eventually left and agreements were signed. We then went to see the steam trains go over the crossing down London Road at Dereham. After this event, Mr Cyril Jolly spent a lot of time at our house covering many months and it may even have been a year. He was extracting information from Bill about the massacre at Le Paradis and subsequent events," Dennis said. ​"One of the PE teachers at my school asked me if I had read the book about my father ("The Vengeance of Private Pooley"). I came home and asked my dad about the book and he gave me a copy, although I didn't read it at the time. He didn't talk about his experiences although I remember Cyril Jolly coming round on a regular basis for a couple of years. The table in the back room got filled with papers and notes and this went on for many months. "Cyril Jolly was a smashing guy, a real gentleman. It was only later that I learnt that he had been evacuated from Dunkirk and had been on the staff of the famous Bomber Harris. 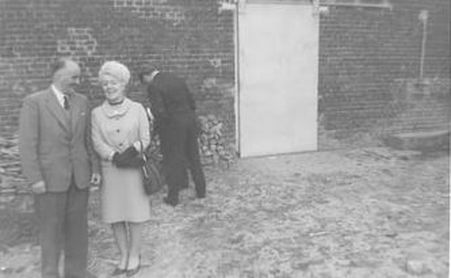 "Bert Pooley came to see us around 1956/1957. I remember seeing Bert asleep in a chair with a crate of beer close to him. He had polished off the lot. I think Bert was far more outwardly affected by Le Paradis than my dad. My father didn't drink to excess although he enjoyed a couple of pints. He was certainly capable of looking after himself. He had been a keen boxer in the army and would certainly always stand his ground. He was also a very intelligent man and at work he could often be quite crafty, " Dennis added. "Then another officer came from the border control, stood to attention, said thank you, saluted and instructed the other officer to let them pass. When travelling again on subsequent nights the police just saw who they were, saluted and waved them through." During his pilgrimages to Le Paradis in the 1960s and 1970s Bill would often sing a song at the Hotel Gai-Sejour in De Panne. De Panne is a Belgian town close to the French border. The hotel still exists. The song was entitled "Sailing." "My father was always keen to go over to France and remember his colleagues and lay a wreath to their memory, " Dennis said. It was 1963 that Dennis O'Callaghan began to understand what his father had been through: "Madame Creton came to Norwich. I was 17-years-old and more interested in motorbikes and girls, but my father had 200 copies of the book and I read it after his death. I have read it six or seven times since. Now when I read it I think, bloody hell, he went through all that and still managed to come out of it a real gentleman. I realised he was a very brave man. The service he saw during 1939 and 1940 was pivotal to the rest of the war. We are immensely proud of what he achieved and he would have been so proud of all the work that so many people have put in to keep the memory of those that died at Le Paradis alive. When he was taken ill he phoned me up and told me he only had six months to live. I think the war had a very detrimental affect on his health. On the 1,000 mile march he was often forced to sleep out in the open in freezing conditions," Dennis said. ​​It was while employed by Hobbies that Bill broke his spine, pelvis and rib in an accident in 1965. The company closed down in 1968/69 after which time he was employed by Metamec until sometime between 1969 and 1971. Metamec manufactured domestic clocks and was based in Bill's adopted home town of Dereham. The name Metamec is an amalgamation of "metal work and mechanics" and ironically the company started life as a subsidiary of the furniture manufacturers Jentique during the Second World War. Jentique made boxes for instruments and bombs during the war. Metamec was a byword for quality in clock manufacture but declined in 1980s, again ironically due to incursions from the German clock industry and imports from the Far East. Metamec went into receivership in December, 1984, and was purchased in 1985 by a West Yorkshire company which continued to use the Metamec name until the mid 1990s. The Metamec site in Dereham eventually closed in 1994. ​From Metamec, Bill moved to employment at Crane Fruehauf Ltd (Cranes) as a fitter welder. Between the two world wars the company manufactured trailers for railway companies and also special purpose trailers for heavy capacity units. Bill continued in the employment of Cranes until his death on 26th November, 1975, at the age of 61. At the time of his death Bill was living at 40, Gordon Road, Dereham. ​Outside work, Bill was captain of the Dereham Fox and Hounds darts team for 20 years from 1949 until 1969, during which time they won the Dereham Darts League on a number of occasions and also played a prominent part in the Norwich Mercury competition - one of the top tournaments in East Anglia. He was also a keen bowls player and a member of Dereham Royal British Legion and the Dunkirk Veterans' Association. Following his death, Bill had a sheltered housing scheme in Becclesgate, Dereham, named after him. William O'Callaghan Place is a reminder of his bravery. Mr Bill O'Callaghan, the Dereham man who lived through a wartime massacre of British troops and then a few years ago survived an accident which broke his spine, has died in the West Norwich Hospital. Mr O'Callaghan, aged 61, of 40 Gordon Road, had been ill for some time and died on Wednesday, leaving a widow, son and daughter. It was close to the French Town of Dunkirk in May, 1940, that Mr O'Callaghan, then an army private, had his first dramatic escape from death. About 100 men from the 2nd Bn of the Royal Norfolk Regiment who had surrendered to the Germans, were gunned down in a farmyard at Le Paradis. ​Among them was Mr O'Callaghan who, despite being wounded in the arm, put an unconscious Londoner, Private Albert Pooley, across his shoulders and escaped while the Gestapo prepared a secret grave for the dead soldiers. Both men, the only ones to survive, were eventually recaptured. Mr O'Callaghan to spend the rest of the war in P.O.W camps and Pooley, still alive today, to be repatriated. Details of the massacre were later set out in a book by Gressenhall author Mr Cyril Jolly and this was eventually turned into a film. Last year, Mr O'Callaghan went to Germany to talk on television about the affair. He had his second lucky escape in March, 1966, when he was involved in an accident with machinery at the factory where he worked. He suffered a broken spine, pelvis and ribs but recovered and returned to work. Earlier this year, failing health forced him to retire from his job with Crane Fruehauf Trailers Ltd, his employers for nearly ten years. He was a keen bowls player and was captain of the Fox and Hounds darts team for many years. Mr O'Callaghan was a much respected member of the Dereham Branch of the Royal British Legion and also belonged to the Dunkirk Veterans' Association. The funeral service will take place at Dereham Parish Church on Tuesday, to be followed by cremation at St Faith's. 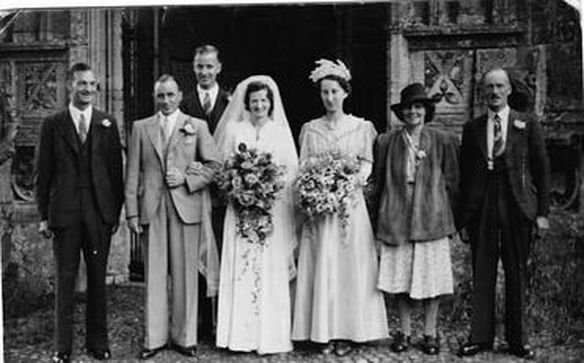 O'Callaghan - November 26th in hospital, WILLIAM REGINALD, of 40, Gordon Road, Dereham, dearly loved husband of Edith, loving father of Dennis and Heather, father-in-law of Margaret, dear grandad of James, aged 61 years. Funeral service, Dereham Parish Church, December 2nd at 2 p.m to be followed by cremation at St. Faith's. Family flowers only may be sent to H.H. Aldiss Ltd, Funeral Director, Dereham, but donations if desired may be sent to Mr. H. Dyer, 1 Potters Bar, Dereham in aid of the Royal British Legion and the Dunkirk Veterans' Association. O'Callaghan - November 26th in hospital, WILLIAM REGINALD, dearly loved brother of Rhoda and Charles and loving cousin of Vi and Ernie. "At the the end May, 1975, Bill had been off work through ill health for some weeks. On attending hospital he was given devastating news. He phoned me at work in Wisbech and told me he had only six months left to live. On that day he was again off to France to 'visit' all his fallen mates at Le Paradis. He went again before his death in the August of 1975 to say goodbye." "A quiet slightly-built man he was the exact opposite of the fictional hero, yet a hero he undoubtedly was as his gallant actions demonstrated in a remote French farmyard on a summer's night 35 years ago." Mr Priest continues with these words: "Miraculously he managed - under the cover of darkness - to drag and carry the unconscious Pooley along water-filled ditches to the comparative safety of a pig sty where they rested up for two days .... For a man who became a legend in his own lifetime, through film and book, he led a very modest existence in an East Dereham council estate. "If as the poet says To live in the hearts of men, is not to die, Bill will be remembered." "We of the Royal British Legion and the Dunkirk Veterans' Association cannot let the passing of this very brave man go without paying some tribute to his great character. "This quietly-spoken slightly built man with the Irish name, but so distinctly a son of Norfolk, joined his county regiment at 17 and served seven years with the colours. Before he could settle back in civilian life came the second world war and experiences, the like of which few men would have survived. He returned to Dereham after the war to live a normal life - or so it seemed. "Only his dear wife Edith and one or two of his closest friends knew how many times he relived that terrible ordeal of the massacre in cold blood in that field near the French hamlet of Le Paradis 35 years ago. The hammering of those heavy German machine guns in the hands of the SS troops was in his ears night after night throughout his life. "Bill will be sadly missed too by his many friends in France and Belgium, particularly by the Creton family and many hundreds of Dunkirk veterans who looked for him on their annual pilgrimage each year. To us he was the V.I.P. 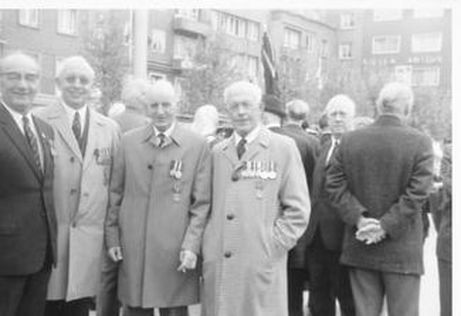 We shall never forget Bill taking the salute at the march past of several hundred of the veterans, British, French and Belgians at Le Paradis when there were high ranking officials and officers on the dais. "Bill had become a legend in his lifetime. At the going down of the sun and in the morning, we will remember him." 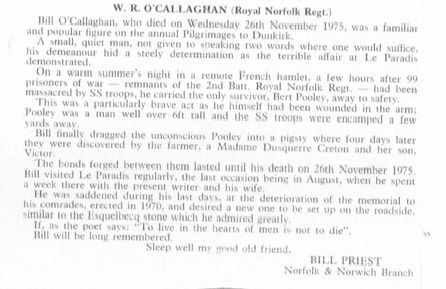 The obituary for Bill reproduced below is taken from the newsletter of the Norfolk and Norwich Branch of the Dunkirk Veterans' Association.